"...the 2016 Châteauneuf-du-Pape Cuvée Vieilles Vignes sports a deep, inky color as well as sensational notes of black currants, smoked meats, earth and crushed rocks. Deep, rich, unctuous and decadent, with huge extract and richness, yet never over the top or overripe, it's a killer wine that's going to flirt with perfection on release." "The cuvée Vieilles Vignes is from 60-110+ year old vines of Grenache, Mourvedre, Syrah along with smaller percentages of other permitted varieties that are grown in these old vineyards. The wine is sourced from 4 terroirs: pebbly clay, sand, gravelly red clay and sandy limestone. 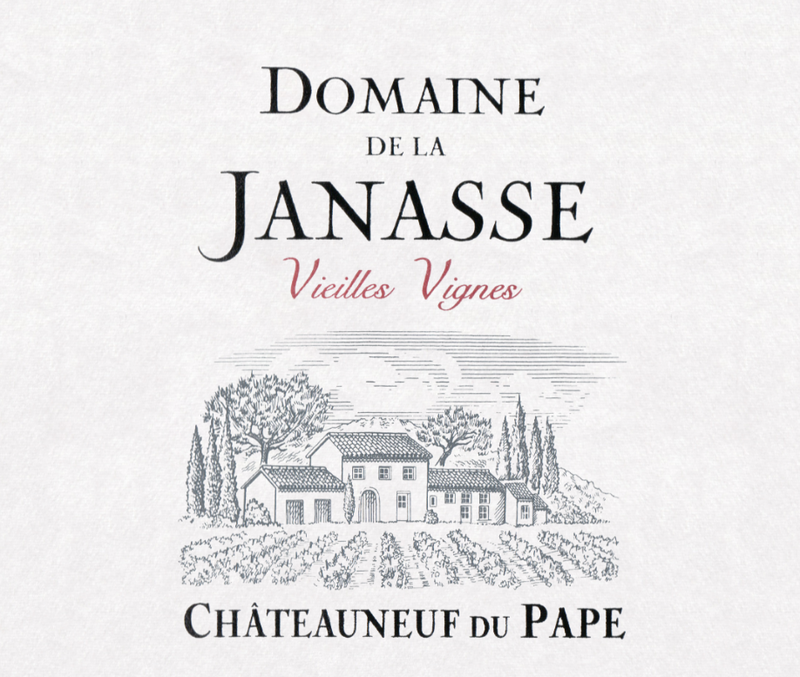 Over the last quarter century, Domaine de la Janasse has become one of the most highly-regarded estates in Châteauneuf-du-Pape. Led by siblings Christophe and Isabelle Sabon, the estate combines the best of both traditional and modern techniques to craft a collection of truly riveting wines from “simple” value-priced VDP’s to their benchmark Châteauneufs. The estate was founded in 1976 by Aimé Sabon, the father of Christophe and Isabelle, who still oversees the vineyards. The property consists of 40 hectares, spread over as many as 70 different parcels throughout the appellation. The terroirs range from sandy soils, as can be found in their well-known plots in the North of the appellation – Chapouin and La Janasse– to lightly-colored clay limestone soils and gravelly red clay and galets, most notable in their plots in Le Crau in the South. While Aimé works the vineyards organically, his children, Christophe and Isabelle, arxe in charge of wine production. Christophe is a self-proclaimed “great defender of Grenache,” which still represents 75% of their vines. With assistance from Aimé’s farming and Isabelle efforts in the cellar, he harnesses the typical exuberance of Grenache-based wines through careful vinifications that respect both terroir and vintage The results are a wide range of rich and flavorful Châteauneuf-du-Papes, Côtes-du-Rhônes and Vins de Pays that are complex and balanced – often in contradiction to an region better known for sheer size and power. In attempting to describe the wines at Janasse one is confronted with the inadequacies in using “style” to express their qualities. While there is a modern facet to the richness of the fruit, it is beautifully paired with a pronounced sense of place and complexity. The reds are not entirely destemmed and see long and gentle macerations lasting up to a month, which may account for some of the earthiness and finesse in the wines. Aging takes place in various vessels from large concrete tanks to foudres, and demi-muids. The barrels are mostly neutral and darkened with age and repeated use. The Châteauneuf-du-Pape Blancs here are frequently overlooked and are some of the best examples in the appellation. Coming mainly from sandier soils, only the Roussanne sees time in barrel while the Grenache and Clairette are age entirely in tank. Minuscule quantities of a reserve Blanc, the Prestige, is aged entirely in demi-muid from 1-3 years old.